This moment is great because it's classic Rudy. It's totally and completely the character we fell in love with during the first season plus, as an added bonus, it's a moment that a lot of people forget about from All-Stars. And luckily, like Rudy's jokes, this moment is short, it's blunt, and it requires absolutely no setup whatsoever. 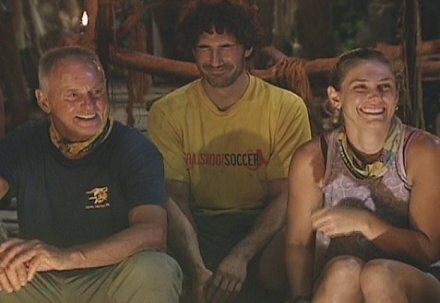 Rudy and Jenna laughing at Tribal Council #2. Ethan (middle) is taking a dump. 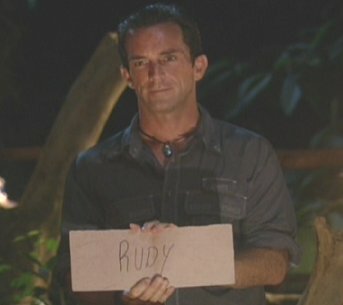 At the end of the second episode, Rudy got blindsided by the rest of the Saboga tribe. He didn't see it coming, he thought he had been completely safe, and it's safe to say that he wasn't very happy about it. And why do I say he wasn't happy? Hmm... well it has something to do with the fact that he actually threatened the other players with revenge in his final words! Take a listen! "If I was them, I'd stay clear of me. 'Cause I got a lot of friends." * (from a confessional) "If we don't stick together, I'll have to break somebody's kneecaps." * (telling Rich what would happen if someone breaks the alliance) "I'd do something to 'em." * (to the rest of the alliance) "I know people back at home. I'll get even." Anyway this is an aspect of Rudy that few people really remember. He has always been a guy who threatens people into staying loyal, that's just how he plays the game. He threatened people in Borneo, he threatened people in All-Stars, and then he topped himself in his All-Star final words by all but calling for a actual Jihad. In fact if you listen to Rudy's extended final words (on the DVD), you can hear that the full interview is even worse! They actually cut it down to make Rudy seem more lovable. Because in the extended version of his call to holy war, Rudy chillingly adds, "When people lie to me, I get even. They just better watch their step, for a long time. 'Cause I got a lot of friends." I mean, how much more direct can you be? The bottom line here? 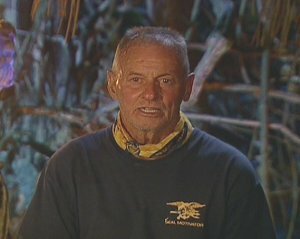 Don't ever backstab Rudy Boesch. Because if you do, you are going to die.